Best Vacuum prices, lowest Vacuum Prices, Top Rated Vacuums, How often should I Vacuum? Vacuuming Your New Carpet Frequently and thoroughly is an absolute must if you want your carpet to last as long as possible. Problem: Most Folks Don't Vacuum Enough. The lack of proper care and maintenance is why abrasion from ground-in dirt and grit can quickly cause your carpet lose its new-carpet shine and appear worn-out and be ugly. Most Carpets Don't Wear Out, They "Ugly-Out!" Abrasion is the root cause! "Ugly-out" is a common term for a carpet that loses it's shine and mats down, especially in heavy traffic areas, like hallways, stairs and main traffic areas. Ground in dirt and grime is the main cause for carpet abrasion and frequent vacuuming is the best way to combat the abrasion problem! You also must have your new carpet professionally cleaned every 18 months to maintain your new carpet warranty. Read your new carpet warranty to see what carpet care and maintenance is required by the carpet manufacturer. Once your new carpet starts to look dull, dingy, matted down and ugly, you have already ruined your carpet. Unfortunately, there is nothing you can do to make your carpet regain its shiny and like-new appearance again. Are your carpets looking old and dingy? Here's why! Abrasion will ruin your new carpet faster than anything else. Abrasion is caused by tracked-in and ground-in dirt and grime and is the main reason why your new shiny carpet fibers will quickly lose shine and cause your new carpet to look worn out and ugly!! Abrasion is grit. It is just like sand. It is just like ground glass. It is capable of ruining your new carpet very quickly. The best defense is regular and frequent vacuuming with a good-quality vacuum and "professional" carpet cleanings at least every other year. If you have lots of foot traffic, then you might want to have your carpets cleaned every year. No carpet manufacturer's new carpet warranty will cover your claim if you have not properly maintained your carpet according to their warranty requirements. If you had vacuumed more often and had professional cleanings every 12, 18 or 24 months as required, your carpet damage may not have happened. It's not too late to start! If you start now, you can help prevent your carpet damage from getting any worse. What is Your Level of Foot-Traffic? If you have lots of Foot-Traffic in your home, then you need to make sure you take POSITIVE steps to reduce the amount of grit that comes into your home on a daily basis. Having a walk-off mat will help. Removing shoes will help, as long as you have slippers available to wear inside. Why? Bare feet and feet covered with socks can easily deposit natural oils onto your carpet pile. These oils will attract dirt and will be a major cause of carpet abrasion. Reduce tracked-in street dirt and grime! It is not enough to just take off your shoes when entering the house, you need to provide "house slippers" if you really want to make a difference and reduce the amount of grit and grime tracked into your home. This is a practice very common in the Asian community. They take off their shoes and leave them outside. They put on house slippers when they enter the home. This is a smart way to help keep your new carpet looking like-new! It's the grit and grime from tracked-in dirt that grinds into the carpet pile that causes of the loss of carpet shine and abrasion. Frequent vacuuming, and regular professional cleanings is the key to keeping your carpet looking like new as long as possible! 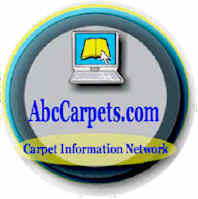 But selecting the right grade of carpet is equally important. Call a professional carpet cleaning company and have them do a deep carpet cleaning. This will help stop the abrasion from getting worse. Visit my free Carpet Care Guide to learn how to make your new carpet last years longer! Read your new carpet warranty carefully. You have certain obligations to properly maintain your new carpet. If you fail to follow the manufacturers care and maintenance requirements, your warranty will be null and void. Answer: How many people live in your home? That's how many times you should vacuum each week, especially in high traffic areas, stairs, and in heavy-traffic areas! 5 people = Vacuum Five times a week. How old is your vacuum?? Is it time to replace it? You need to have a good quality vacuum cleaner. Having a good quality vacuum with enough suction power is important. Why? Because abrasion is the main cause of carpet wear and tear. You can see the effects of abrasion most obvious in hallways or other main traffic lanes and on stairs. Carpet fibers can only tolerate a certain amount of abrasion before they show the permanently damaging effects caused by abrasion. The more people living you have living in your home means more vacuuming may be necessary. If you have a smaller home, vacuuming is more critical than if you have a larger home. For example: Five people living in a 5000 square foot home usually requires less vacuuming then does five people living in a 1200 square foot home. Take my free Carpet Foot-Traffic Test to help you determine what grade of carpet you need to buy, based on several key factors. Learn More What Grade of Carpet Should I Select? There are many reasons why you should be vacuuming almost everyday, but vacuuming everyday won't help much if you don't have a good quality vacuum or if your vacuum is not operating at it's peak efficiency. If your vacuum is not doing a good enough job, the dirt that penetrates the nap of your carpet will begin grinding away at the fibers removing the shine and the like-new appearance. This leads to dulling of the color and matting and crushing of the pile. This quickly makes your new carpet look worn-out faster. Once your carpet starts looking dull and dingy, nothing can be done to make it regain it's original like-new appearance. There's more to maintaining your carpet than just dealing with the problem of dirt and dust penetrating the nap of your carpet, small children and active teens and pets can significantly increase the daily wear and tear on your carpets. Running, jumping, sliding, and other common playful activities are very hard on carpet. Rigorous activities force dirt and debris down deep into the nap, often too deep for some older or less-powerful vacuums to remove effectively. Sliding heavy objects like furniture across the carpet can also be very damaging to your carpet. It's better to lift heavy objects into place or use a dolly to roll items into place. Just like the skin on your knees, your carpet can get a "rug-burn" which can actually melt the carpet fibers causing permanent damage. There are many good quality vacuums available today and while I don't personally recommend any one model or brand in particular, I have a friend in the business who can help you make a wise and informed choice. You have to decide which vacuum will meet your needs and goals (and pocketbook!) Do you want professional help choosing the right vacuum for you? The Dyson was the first vacuum I saw with the cyclonic feature and that is why I bought one. It is a very useful and powerful vacuum and it never loses suction power. It has easy to use attachments and my wife just loves it too. With four teens and two cats in the house, we needed a super-duper powerful vacuum to deal with all the pet hair and tracked in dirt. There were several other brands that I liked too. Dyson has several models to choose from, including models designed for homes with pets, that's the one I purchased for my family. Be prepared to spend several hundred on a good quality vacuum because it's a wise investment. You have to consider the cost compared to the increased lifespan of your carpet. How much does new carpet cost? A good vacuum can literally help your carpet last years longer. Using a bad vacuum or not vacuuming enough can cause your carpet to lose half of it's intended life span. Ouch! Beyond these two basic functions, every other added feature you may opt to have on your vacuum just makes using your vacuum more fun, easier to use, and makes you feel better about what it cost you. You don't have to spend more for features you don't need so consider your situation carefully. It's like buying a car, you can pay extra to get air conditioning if you want, but you may not need to if you live in Alaska. You must follow your carpet manufacturer's carpet cleaning guidelines to the letter if you want to keep you carpet warranty in force. You can clean your carpets yourself if you keep all the receipts for cleaning solutions and detailed records. Before and after photos would be nice to have too. Otherwise, you should hire a professional to clean your carpets every 12 to 18 months. Keep the sales receipts! Read your carpet warranty and follow the carpet maintenance suggestions to the letter. Visit my Carpet Cleaning Care Guide to learn how to make your carpet last years longer. It's hard to find an honest and reputable carpet dealer these days! That is why I have built my own special list of hand-picked carpet retailers who I trust to be locally owned, give free estimates, offer fair prices, have knowledgeable staff, provide honest measuring and hire qualified installers. Can I buy vacuums wholesale? How important is a carpet vacuum cleaning schedule? How often should I vacuum new carpet? Which vacuum should I buy? Should I fix my old vacuum? Best vacuum for dogs. Best vacuum prices. Recommended vacuums, honest vacuum dealer.